Goldfish Swim School is building a 9,000-square-foot center in Ashburn, with a spring opening planned. 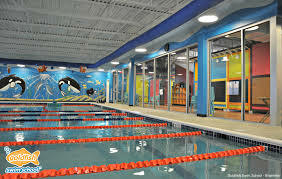 Goldfish Swim School Ashburn, located at 21140 Ashburn Crossing Drive, Suite 115, will provide swim instruction to children ages 4 months to 12 years old with small class sizes, diver-free, 90-degree pools, and a state-of-the-art water purification system. Goldfish offers perpetual lessons and families can enroll at any time. In addition to swim lessons, the center will be open for weekly family swims (for both members and non-members) and party packages. Facility highlights include an air-conditioned viewing gallery for parents to watch lessons, a family dressing area with private changing rooms, snack bar and retail shop. As construction continues, Goldfish Swim School Ashburn is seeking to fill positions for certified swim instructors, deck supervisors, lifeguards and customer service roles. Check facebook.com/goldfishashburn for the latest updates.